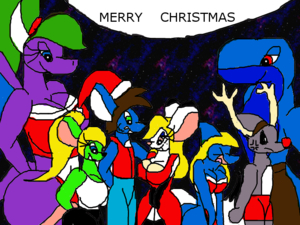 My OCs I mainly draw are: Matthew, Matilda, Flipper, Bluey, Ashlly, Big Rhonda, and Cinnamon. the rest of the OCs will still appear, but not as much. I win! Now say my name! Thanks for the favorite, Matt. ‌Thanks for the favorite, Matt. Thanks for the favin', hon. ‌Thanks for the favin', hon. Thanks for the fave, Matt. ‌Thanks for the fave, Matt. Thankzz for the fave "Bink and Tammy"
I like her, but also someone else is suppose to be drawing her, if they don't forget it.